The Body Impolitic is a critical study of tradition, not merely as an ornament of local and national heritage, but also as a millstone around the necks of those who are condemned to produce it. Michael Herzfeld takes us inside a rich variety of small-town Cretan artisans’ workshops to show how apprentices are systematically thwarted into learning by stealth and guile. This harsh training reinforces a stereotype of artisans as rude and uncultured. Moreover, the same stereotypes that marginalize artisans locally also operate to marginalize Cretans within the Greek nation and Greece itself within the international community. 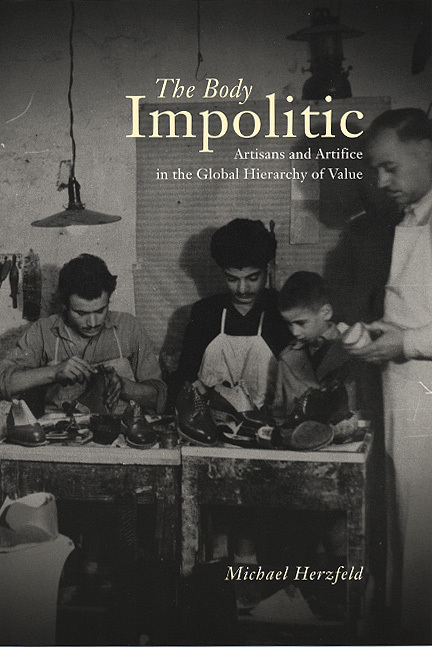 What Herzfeld identifies as "the global hierarchy of value" thus frames the nation’s ancient monuments and traditional handicrafts as evidence of incurable "backwardness." Herzfeld’s sensitive observations offer an intimately grounded way of understanding the effects of globalization and of one of its most visible offshoots, the heritage industry, on the lives of ordinary people in many parts of the world today.